There are two inescapable facts about playing cricket in Sri Lanka. Firstly, the conditions are oppressive - very, very hot and very, very humid. The second is that the majority of the play revolves around spin bowling on dry, dusty, turning pitches. And, it is these factors that make Sri Lanka tours one of the most challenging in Test cricket. It is very hot at this time of the year, which means the majority of the time you are soaking in sweat and generally feeling downright uncomfortable. The Galle pitch is as dry as I have seen on the day before a Test match, so we can expect to see spinners dominating proceedings for the next five days. Fortunately the majority of the Test squad were here for the successful one-day series and have had plenty of time to gain experience in these conditions. There is an air of confidence within our ranks as we prepare for what is an important series for the team. Ricky Ponting captains the Test side for the first time and is keen to improve our performances overseas, particularly on the subcontinent. The biggest dilemma facing the selectors is getting the balance of our team right. Our squad is as strong as I have ever toured with and it is going to be a very harsh on at least two of our players who will miss out on selection. Whether Shane Warne plays remains to be seen, but all I can say is that he has a new lease of life after his 12-month lay-off, and looks fit and hungry to get back into Test cricket. He bowled beautifully in last week's practice match and looks set to make an impact in the Test arena. Having played with him for the last decade, I cannot remember seeing him so excited about playing. There are few better spectacles in the modern game of cricket than watching the sporting poetry that is Warney delivering one of his array of leg-spinners. 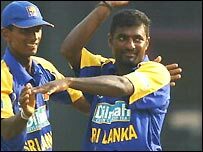 On the other side of the coin, Sri Lanka boast a similar master of spin in the great Muttiah Muralitharan. So far this tour our batsmen have played him pretty well, but we have no doubts that he will be a different prospect in the Test matches. The battle against him is one of the toughest in our game, especially on his turf. From a personal point of view my last tour here was disastrous so I am looking forward to conquering the demons of four years ago. Playing spinners of the calibre of Murali is a tricky proposition but for me it is another opportunity to tick off one of the challenges faced within a long Test career. This series promises to be a wonderful display of cricket skill, endurance and concentration. Winning the first session and first day of a Test series are always high on our list of priorities. It is not going to be easy, but I believe we are ready to become the complete team by winning Test matches in conditions like these.